Eastern junior Ally Durst, right, sprints toward the finish line ahead of a pack of runners during the 2017 OHSAA Division III girls cross country championships held Saturday at National Trail Raceway in Hebron, Ohio. HEBRON, Ohio — An old hat with a new fit. 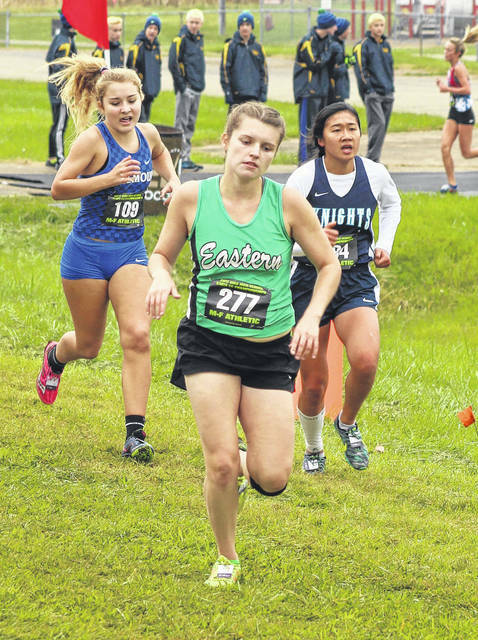 Eastern junior Ally Durst became the latest Lady Eagle to compete at the highest level on Saturday during the 2017 OHSAA Division III Cross Country Championships held at National Trail Raceway in Licking County. 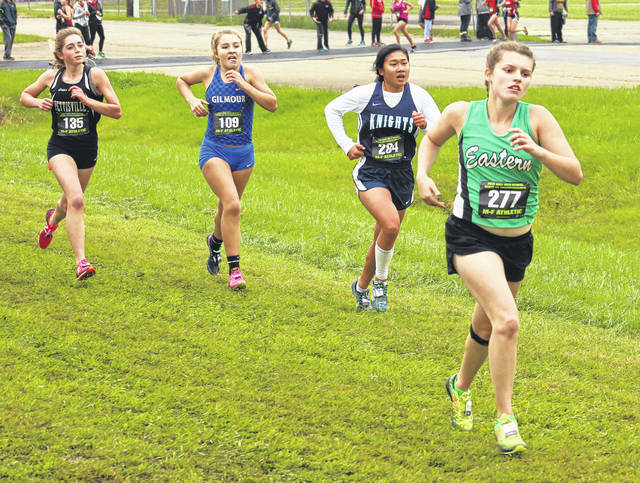 Durst — who was competing in her first state final — extended the Lady Eagles’ streak to five consecutive years with at least one runner in the championship event. There were 20 teams and 183 competitors in the D-3 girls final, and Durst ended up 87th overall with a time of 20:44.2. Durst was 90th (6:17.8) at the 1-mile mark and was in 84th place (13:14.9) at the 2-mile split. Durst’s time was almost 30 seconds off her 16th place regional mark of 20:18.41, but the junior wasn’t discouraged that she didn’t have her best race of the year. Actually, as she noted afterward Saturday, it was probably the most memorable race of her life — regardless of the final outcome. And, with any luck, Durst will have another chance to take in this experience. “It was a super-amazing experience and it was a lot of fun. I need to thank my teammates and coaches for pushing me to get where I am,” Durst said. “I’ve been running since I was in the eighth grade and I have had some great teammates along the way that also ran in this race. I’ve always wanted to be one of them, one of the Eastern girls to compete at the state meet. Now, here I am. EHS coach Josh Fogle — completing his 13th season at the helm — admitted that it never gets old seeing an athlete compete at the highest level, especially for the first time. The venerable mentor has seen several Eastern athletes finish the year at state during his tenure, and Fogle was pleased to see Durst become the latest member of a pretty elite club. The Lady Eagles claimed both a Tri-Valley Conference Hocking Division title and D-3 district championship for a seventh straight fall, and having the state-qualifying streak extended to five straight postseasons was just another feather in the cap for Eastern. When asked how gratifying this day and this season truly was, Fogle quickly deflected all the credit to the kids in the program. “The kids have built the program to where it is. As a coach, you just cannot do anything without the kids,” Fogle said. “We’ve won seven straight TVC Hocking titles and seven straight district titles to go along with five straight years of having a competitor at the state level. That’s the part that I take pride in as a coach, seeing how hard the kids work to continue the tradition we’ve been able to build here at Eastern. Minster was on the D-3 girls title with 34 points, finishing 97 points ahead of runner-up Mount Gilead (131). Emma Watcke of Minster was the individual champion with a time of 18:38.4. East Canton (120) defeated McDonald (140) for the D-3 boys team championship. Chad Johnson of Colonel Crawford won the D-3 race with a mark of 15:33. Lexington won both the boys and girls team titles in Division II. Zach Kreft of Buckeye Valley was the D-2 boys champion with a time of 15:20.6, while Annie Zimmer of Chagrin Falls was the D-2 girls winner with a mark of 18:13.5. Hudson won the Division I boys team title, and Dustin Horter of Lakota East was the individual champion with a mark of 15:03.5. Centerville was the Division I girls champion, with Morgan Gigandet of Troy claiming the individual title with a time of 17:30.9. Visit baumspage.com for complete results of the 2017 OHSAA Cross Country Championships held at National Trail Raceway.